Between 2012 and 2014, Ultra Zook from Clermont-Ferrand in central France releases three EPs titled respectively Epuz, Epuzz and Epuzzz. On all of them, the trio offered their own vision of rock in opposition thrown in a tropical meat grinder. Then it was quiet for a little over four years, before they were back with their first self-titled longplayer, released on a couple of labels, among others on Dur et Doux, the current frontrunner when it comes to avant prog from the hexagonal country: PoiL, Ni, PinioL and Chromb! After all these years, Ultra Zook are still recognisable but have also evolved tremendously. On their EPs, they always tried to strike a balance between the humorous and the earnest, which mostly succeeded, but one thing was still lacking. And that’s what has changed over the years. The trio has finally learned to fill an entire album with perfect songwriting that fills each and every track with memorable lines, witty ideas and instrumental excellence. Needing no guitars, the three musicians play keyboards, bass guitar and drums, with the bassist adding occasional flute parts, and a guest musician on bagpipes on two tracks. The opener What Kind Of Juice Fruit Are You? asks the question whether you’re an apple, a pear, a prune or a peach, but it turns out that we’re passion fruit after all. This is packed into some kind of progressive zouk rock, and although the band always claimed a tropical side, they have finally managed to merge it with their avant prog sound. The vocals during the verses are cartoonish, the chorus goes into a more prog rock direction, and the ear shattering flutes adds a weird folk touch. Conderougno continues in that direction, with a certain Hispanic feeling and a seemingly made-up language that gives this strangely melodic piece a certain sense of vocabular deconstruction. The chorus is once again from out of this world, cheesy, but classy too, and it’s in these moments where you notice how much Ultra Zook have matured over the years. La Plasticité mentale du Monsieur is a rhythmically complex piece with vibraphone and analogue synthesizers which towards the end enchants with a weirdly silly chorus again. My favourite track is Gibeli Gibelo, a naughty folk song from the Auvergne region that Ultra Zook transformed in their usual madcap way. It’s still a lot like the original, but with better instrumentation. Ping Pong ends the A-side with simply the lyrics Ping Pong sung over a strange rhythm. At the three-minute mark, a ping pong match is mixed into the song, giving it a veritable breakbeat touch. The B-side starts with Hmong Song, another rhythmically complex exercise, whose latter half consists of distorted vintage synths and an improvised flute solo that evokes the early days of Soft Machine. En veux-tu, en v’la comes with a lot of silliness, a little like a children’s song, although with occasional danceable techno beats. Whoever said that you can’t dance to progressive rock must have been clearly wrong! Frangipanier is another Caribbean influenced song about trees or plants. Espions du Ciel has an 8-bit Nintendo sound with breathy vocals sounding like Robert Wyatt on helium and an ending reminding of Mr. Bungle at their most unpredictable. The album concludes with the two minute short Kawani, with a beautiful flute intro and a structure reminding of French pop music from the Sixties or Seventies. What a way to end a perfect album! 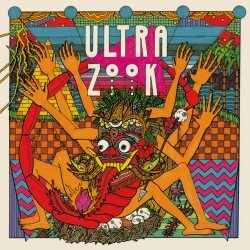 Ultra Zook were already quite intriguing on their EPs, but it took them years of maturing to come up with this genial piece of work. This self-titled debut album offers everything that makes avant prog or rock in opposition such a wonderful thing to listen to: catchy choruses, a high degree of unpredictability, musical dexterity and a strong sense of humour that said genres unfortunately lack so often. Ultra Zook can easily sit beside their aforementioned label mates on the French progressive music throne.